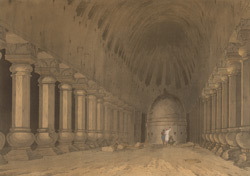 Plate 12 from the fifth set of Thomas and William Daniell's 'Oriental Scenery' called 'Antiquities of India.' The interior of the Caitya hall at Kanheri is divided into three aisles by two rows of octagonal columns. These have pot bases and cushion capitals and animal brackets topped by elephants, horses and human figures. The vaulted ceiling is monolithic but is carved like in wooden architecture. In the far end of the apse there is a plain hemispherical Stupa, the symbol of the Buddha in early Buddhism. The cave temple dates from the 1-2nd centuries AD.